Sorry I haven't been keeping up on my posts as well as I should. Today will be an update on 16 weeks and my Dr appointment last week Friday at 15 weeks. So first for the update from my Dr appointment last Friday. The Appointment went well, my cervix is still looking good, we saw the baby on the ultrasound wiggling around, and the biggest news (most of you have probably already heard this) the Dr thinks it's a boy! She is not 100% since we go to a medicaid clinic the ultrasound machine is VERY low quality. We will be getting our anatomy scan with a much better machine at 20 weeks so then we should know the gender for sure as long as the baby cooperates. 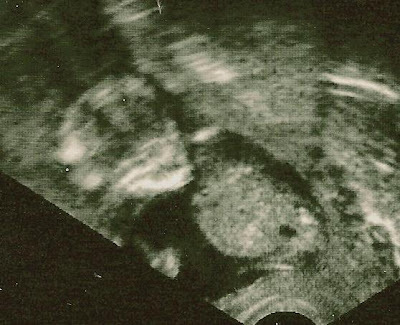 Here are the pictures we got from our ultrasound last week. Now an update on how we are doing this week. Funny thing is that Teddy Graham has been so uncooperative this week. Jeremy and I attempt to listen to his heartbeat once a day and lately he will not hold still, as soon as we find him, we hear an almost shuffling noise and then he moves and the heartbeat fades away, if we want to listen more we have to search to find him again. I think he is really active, I'm still feeling him move, not everyday, but then some days I feel it more than once. I think it is so much fun and I can't wait until he is big enough for other people to feel him too! One really strange thing that has been happening to me all week is that every evening around 8:00 pm my throat starts getting REALLY dry. I get so thirsty, and it's not for lack of drinking, cause I have been doing really good lately about drinking water throughout the day. Then when I go to sleep it gets worse and will actually wake me up. I feel like I've been walking in a desert all day. I've been drinking lots of water throughout the night to help my dry mouth and throat but now it's also making me have to get up WAY to much to pee, Some nights I get up 10-15 times. we bought a humidifier to put in the room, but it has only helped a bit. Funny thing is that this only happens at night, I don't feel like this during the day, and by the time I wake up in the morning I feel normal again, but all night I feel as if I am dehydrated! so weird, I'm going to have to ask the Dr about this one, cause it's kind of rough and I wonder what's going on. another interesting thing that has become very noticeable this week is my veins, the are getting more prominent everywhere, my chest and even my feet now have much more noticeable veins, so interesting! I'm so glad to be over the cold I had and to have had no other serious issues this week! No trips to the ER hurray!!!!! By this time next week I'll be more pregnant than I've ever been. I'm about to embark into uncharted waters, I'm excited and nervous. Hoping and praying for the best, and I'm so glad that I'm growing Teddy Graham and I have Jeremy to support me along the way! Here is a fun comparison I thought I would share. 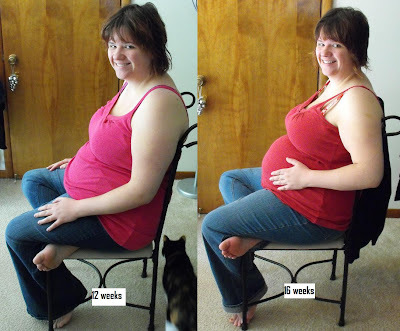 12 weeks vs 16 weeks sitting down tummy... grown a bit huh? Also if you read my post about the ER visit from last week you know I had a very bad IV experience. This week the bruise is still there, but I also went to the bathroom in the middle of the night the other day and didn't realise the bathroom door was closed so I smacked right into it with my forehead and smashed my hand into the doorknob and rebruised it, the fresh bruise is the pinker part near the bottom and the older bruise that is darker is still from the ER... fun huh? 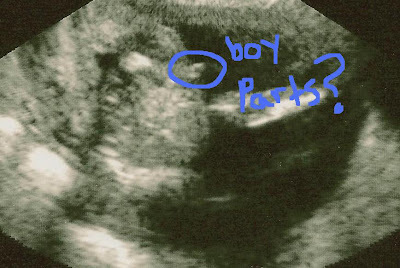 Maybe a boy! I can't wait for you to find out for sure :) You look great, and I'll keep praying for a healthy baby and pregnancy. Love the belly!!! 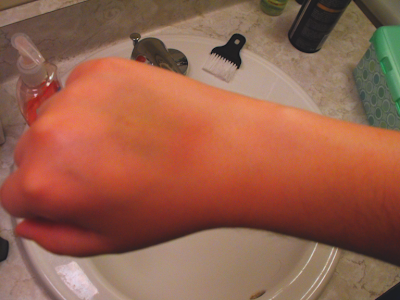 Don't love the bruise. :( Go Teddy Graham!!! I had the same problem with my 1st pregnacy with being thirsty at night. I loved apple juice and would go to the frig and guzzle it down from the jug (since Rob was overseas). I forgot about that until you mentioned that. So happy things are going well! I will keep praying! !